Taking a shower is an easy part of most daily routines, but can be a challenge for people with physical impairments. Tasks ranging from being able to stand in the shower to shampooing hair are seemingly impossible without hands-on assistance, shower modifications, or technological devices. Empowermate Systems, Inc. strives to solve this dilemma with their recently created automated showering system, soon to enter the marketplace. This system allows physically challenged individuals to remain seated while being able to wash from head to toe, as well as front to back. Users will gain greater independence because they can use the system with little or no assistance. Smart Products has worked closely with Empowermate Systems over the past year by identifying their flow control needs, supplying pumps and valves, and assisting them throughout the project’s duration. “Empowermate Systems produces automated technologies to improve the lives of the physically challenged and enable an independent lifestyle. Our trademark is ‘automated systems for independent living.’ We went with Smart Products for our needs because of good performance, cost-effective price, and very professional customer service,” says William Shrewsbury, President of Empowermate System, Inc. 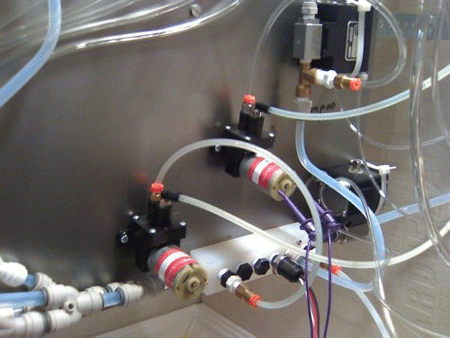 The system requires two Smart Products Liquid Pumps (pictured right in the Empowermate test lab) to dispense shampoo and body wash. Additionally, two 214/214 check valves are used with the pumps to prevent back flow into the dispense lines.